Home / Is It Time to Replace My Sliding Glass Door? Is It Time to Replace My Sliding Glass Door? Many homes around the Raleigh/Durham area were built with a sliding glass door in the back. And now, due to their relatively low price, sliding glass doors are becoming more popular than ever in homes across North Carolina. Here’s the trouble: a huge percentage of the sliding glass doors that are in use in homes are of very low quality. Some homeowners remember having a less-than-impressive sliding door when they used to rent an apartment, and the door in their home is of the same low quality. There are, however, high quality sliding glass doors available. These high quality doors are equipped with ball-bearing rollers that will provide easy operability for years to come. They are resistant to water infiltration, rot, and mold. And they are much more energy efficient than the builder-grade doors that exist in so many homes. If you feel like you are stuck with a builder-grade door, one that does not open and close easily and that leaks air and water into your home, do not despair! 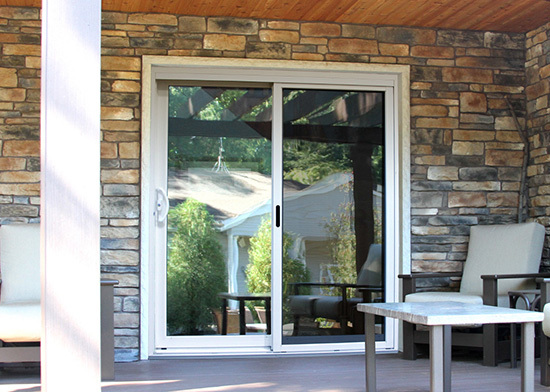 Sliding glass door replacement is an easy and affordable process that Kelly Window and Door can help you through. Our showroom has a sliding glass door with your name on it, so come check it out. Or just fill out the form below and we can schedule an in-home consultation where you can see first-hand the benefits of having your sliding glass door replaced. Whether you visit us or we visit you, you’ll see first-hand how much energy efficiency and comfort you can gain by having your drafty sliding door replaced. Kelly Window and Door is the Raleigh sliding glass door replacement expert!